Euro gold rose to about €1288, platinum gained $6.15 to $1423.50, and copper gained 6 cents to about $3.44. Gold and silver equities fell about 2% by midmorning and remained near that level for the rest of the day. Tomorrow at 8:30AM EST brings Import and Export Prices for June and Initial Jobless Claims for 7/07 expected at 375,000. At 2PM is the Treasury Budget for June. Oil remained higher after the Energy Information Administration reported that crude inventories fell 4.7 million barrels, gasoline inventories rose 2.8 million barrels, and distillates rose 3.1 million barrels. The U.S. dollar index ended slightly higher in mixed trade. Treasuries erased early losses after today’s $21 billion 10 year note auction sold at a high yield of 1.459% with a bid to cover of 3.61. The Dow, Nasdaq, and S&P remained mostly lower after today’s fed minutes seemed to lack the clear signal for more stimulus that many were hoping for. Among the big names making news in the market today were Encana and Chesapeake, JPMorgan, AMR, Peregrine, Bank of America, and Airbus. 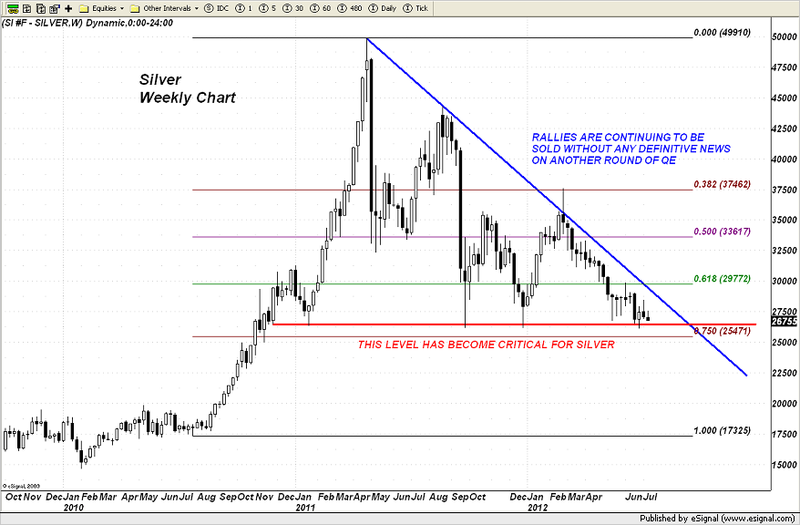 “Taking a look at silver on the weekly chart it is not too difficult to see that it has been in a well-defined downtrend since peaking in the spring of last year. Rallies are being sold but dips into the region near $27.00 - $26.00 have been bought. The result has been to form a perfect triangle pattern on the chart. This latter or bottom level of support has thus become CRITICAL to the future prospects of the metal. It is getting very close to this downside line again this week. Bears are going to continue to try to press it to see if they can push enough longs out of the market to break it lower. If the bulls falter or waver in the least, the metal will buckle and then drop very quickly to the 75% Fibonacci Retracement level near $25.47 with the $25 level also within range. New York Sun: What's so magical about interest-rate rigging? Note: Change in Total Tonnes from yesterday’s data: SPDR subtracted 4.225 tonnes. COMEX Gold Trust (IAU) Total Tonnes in Trust: 180.96: No change from yesterday’s data. Silver Trust (SLV) Total Tonnes in Trust: 9,729.89: No change from yesterday’s data. NovaGold’s (NG) Feasibility Study and permit applications, Comstock’s (LODE) crusher, Timmins Gold’s (TGD) credit facility, Goldcorp’s (GG) guidance update, Aurcana’s (AUN.V) second quarter production, Excellon’s (EXN.TO) suspended operations, and South American Silver’s (SAC.TO) response to Bolivia were among the big stories in the gold and silver mining industry making headlines today.